Yes you can do that, but best if you can get it on your target directly. Nothing to stop you from trying and see what results you get. as intention is a key to our workings can I ask the following question. If I do hotfoot work on my ex to get out of my life and cut control from MY life is that possible or would it also trickle into his relationship with our girls? He does need to ease off their backs but I wouldn't want him to just cut off from them (he also financially contributes to them which is essential as I am looking for more work right now). My understanding is the intention is what will power the spell. So if I aim it at the ex getting out of my life it will remove him from my life (maybe make him antsy about being so controlling/at my house all the time). I think it would be tricky to try to Hot Foot this man out of your life but not out of your girls' lives. I just don't see how that could work. I agree with Sister Jean. Hot Foot is a serious step and considering he will still be around the children that you share. So you want no connections with him? ...if you want to remove the feelings you have for him...I am thinking of cut and clear and still that may result in an outcome that may affect your children in the long run. You may want a reading on this to determine a better approach considering you have children to consider. Good Luck! I got desperate and started using hot foot at work coz there's this very "good girl" I won't name religions, but supposedly she's very religious, very into church and a good girl. Anyways, she's been a bully to me at work but my boss protects her. So I used hotfoot oil on her, now 5 days later she comes into the office, saying she had a dream, where she went to a festival and they were doing witchcraft but God was telling her to run back and she threw up 3 things. I'm starting to think she's into hoodoo herself, she's taking a vacation this wk to New Orleans, to visit family. What can I do to hide this from her? I read somewhere, where I can use bay leaves? Could she be sensing the hot foot oil? I want to say that LM hot foot products have worked for me. I tried making my own, prayed over it but it doesn't seem to be working. I put LM hot foot oil in my mother in laws shoes along with a little chant last year and her visit was cut short -- many arguments and she wanted to go home. She is extremely meddlesome and my husband always takes her side. She basically comes first. She visits every 6 months to keep her green card active. I don't want to divorce over this but now she has visited again and I don't have any LM hot foot products on hand but she only has one week left before she leaves. She is also very spiteful towards my kids too. Double trouble when she comes because my husband makes fun of me more I guess to make her happy. She feeds on the drama. 1. Is there anything that would make her stay away permanently? 2. Does hot footing have to keep being repeated? I read somewhere that usually one working should make them stay away. 1) Probably not as she is his mother. 2) Not usually, but not everyone is trying to hot foot a man's mother. Anything about how a spell "usually" works is just an opinion. Parent child connections are often (but not always) greatly more intense than marriage bonds. I bought some hotfoot oil. Can some tell me how to use it to make my Step daughter move out and stay out? Hi, I'm new to the forum. I do have a question. I'm not a practitioner; however, I'm not timid or doubtful of the use or practice of magick/ hoodo. My question is instead of anointing and burning a candle with Hot Foot products, may a picture of my target be anointed with Hot Foot oil and powder and burned in the same manner as a candle. I have read the instructions on how to do the work using Hot Foot products and cleansing before and after the work very thoroughly. However, my teens are nosey and I don't want them snooping around and becoming overly inquisitive about my work. So using a picture would be more discreet on my behalf. If I can't use a picture in lieu of a candle; may I burn the candle on an old grill in my backyard? It will be out of the sight of my teens. Thank you for your assistance with regards to this post. Want place a black candle spells with hot foot oil spells a man to keep away from my place of work. I have been using the spot of land to bring tourist and it was slow before but now the place is getting popular. Now this man is jealous and now he started building a shad near the area. And I don't know what he plans to to there. It looks like he want to take over the place from me. His girl friend is also pushing him to do all of that. I have flowers planted and some vegetables planted and he goes about ripping them off when I am not around, in an effert to get me frustrated. I also have reason to believe that he stole some ropes I used as railings along my trail. please give me some spell to have him and his girlfriend to keep away from the area. The area has waterfall and hot mineral pools . It's near the volcano. I call the spot sapphire falls & Jungle Spa. This is where I make my leaving and now they are trying to fight me. I don't want him nor any of his family to come near the area. I use hot fool oil in his foot prints and areas where he can walk over it but I must have done it wrongly and it didn't work. I will try again and say a short prayer just like what I seen in this forum. Help me out please with a vary effective spell . I wouln't mind him but he refuses to shower more than once a month (if we are lucky) and if you ask him to shower he will give you the evil eye. Also he does not wash his hands with soap after going number two and then goes around opening doors and what not. I have to constantly sanitize the doorknobs in the house and use my shirt or a cloth to open and close doors. He mentioned when he first moved in in a conversation with me that he once dabbled in magick but he is quite literally borderline retarded from his seizures which he suffers from very badly from and so I do not see him casting any types of spells to stop them from working and I'm pretty sure he's never heard of hoodoo. Does anybody know why he just will not go even after 8 hotfoot workings over the past 15 months. It's beyond ridiculous...he will just not go. I want to move away from my mom’s attachment and move away from her house and her presence. How can I use Hot Foot oil to achieve what I wish for. But not physically causing harm for her. Just want her to let me go. It is not appropriate to apply Hot Foot Oil to oneself, as the oil is to make someone move away and wander the earth and never return. That would be a bad idea for you. I recommend that you use Separation Oil on your mother (or on a candle to represent her) to painlessly cut ties with your mom, and Road Opener Oil on yourself (or on a candle to represent yourself) to open up a bright new future for yourself. Thank you so much! That’s very helpful advice! 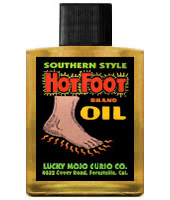 If i touch hot foot oil or any product of hot foot will that hot foot myself? the other day some hot foot oil got on the outside of my foot i was wearing shoes so it got on my shoes! also when applying the oils to candles or any other surface to i need to wear protection such as gloves to not come into physical contact with it? No, Hot Foot will not suddenly "turn" on you and bite you like a rabid rat. To use oils and other supplies, you call the name of the one on whom you wish to have an effect on and you pray (for good) or curse (for harm). In my opinion you should learn more about how hoodoo works before trying to use and buy supplies. Ask questions and we will answer -- and when you have the knowledge in hand, then purchase what you need. Never undertak a spell about which you are confused, unsure, or ignorant. Blood ties? Is this the case with fake relatives with no real ties (like no blood or marriage connections). For example you moms best friend you call aunt but she is not actually your aunt just your mothers best friend that hangs around...are those ties equivalent to family or are they easier to get rid of? You can rid a person from town but if they have strong ties they may come back and the work will need to be repeated. Doing a break up on the people and hotfoot at the same time may send them away and keep them away. Its not that you cant hotfoot family its that they will come back because of ties and you will continue repeating the work to keep them gone. People have hotfooted a husband who was abusive or a cheating spouse it can be done.